Like any other dental professional, dental hygienists must practice evidence-based dentistry (EBD) to provide the best care to their patients, whether it be through scaling and root planing, caries prevention, or patient education. 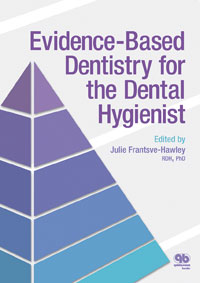 This book is intended as a textbook for dental hygienists to learn the importance of EBD in the practice of dental hygiene as well as how to implement EBD practices and share EBD findings among office staff. As the dental knowledge base evolves and scientific discoveries are made, dental hygienists must understand how to seek out and evaluate findings and, if appropriate, apply them in their clinical practice, and this book provides all the necessary tools to do just that.